"Meatballs with rice in them, cooked in tomato soup. Serve with mashed potatoes and beans or on a bed of rice, if desired." In a large bowl, combine the beef, rice and egg beat. 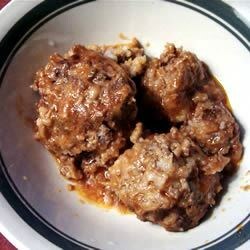 Mix well with hands, making mixture into medium sized meatballs. Set aside. Pour soup into a large saucepan, and dilute with 1 can of water. Heat to simmering over medium heat. Lower heat to low, drop meatballs into soup and simmer for 20 to 30 minutes. These gluten-free cookies feature walnuts, dates, brown sugar, and coconut.